For the third night in a row, I'm sitting down to write a post and it's late and I'm beat. But it makes me feel like I live here when I run myself into the ground and I can sleep when I get home tomorrow evening. I had another great, great day. I spent the first part of it talking to Yakov and Angela Hanansen, two great mosaic artists with a studio and mosaic school in Chelsea. Yakov's latest work was unveiled last week and I was indeed fortunate to be able to see the work and have him describe it to me. 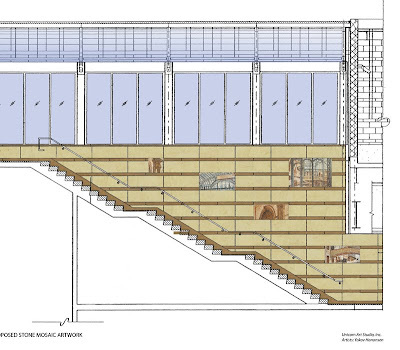 His installation is in a new 7th Avenue entrance to Penn Station and it consists of marble mosaic detail shots of the original Penn Station embedded in a wall of the current Penn Station. He described his work there as an expression of the fragmented nature of memory. Since people remember things in small fragments, it made sense to use small fragments of marble to illustrate New Yorkers' collective memory of the much-loved and now long-gone original Penn Station. Brilliant and to hear the artist describe his work to me in those terms while we sat in his studio was a real thrill. Look for more about the Hanansens after I get back to my usual routine next week. After that, my great and smart friend Tom and I took a walk through his neighborhood and looked at architecture. Tom's been a New Yorker for nearly 30 years and I swear he knows every square inch of this city by heart. Walking around with him is an archeological expedition and I can't get enough of that stuff. Today we walked the new High Line Park, which is spectacular, and then he pointed out the old department stores along Sixth Avenue. I have walked down Sixth Avenue more times than I can count, but I've never really noticed the buildings that line it. I like to think of myself as the guy who notices everything, but clearly, my attention to detail can be flawed. This is the original O'Neil department store. 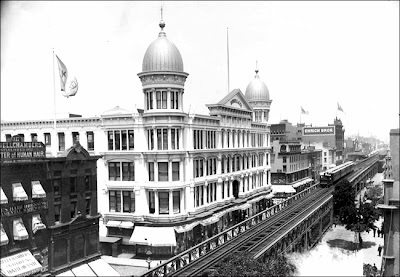 Sixth Avenue had an elevated railways running down the middle of it 100 years ago and lining Sixth from about 17th to 23 Streets was what was knows as The Ladies' Mile. 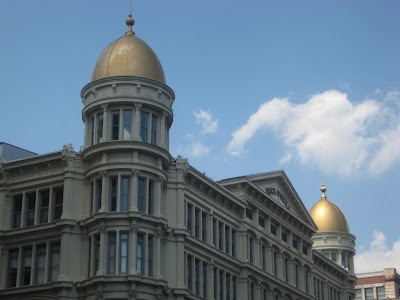 The Ladies' Mile was where the dry goods, department stores and dress shops were centered in the Manhattan of the last century. Here's the O'Neil department store today. Like everything else in Chelsea, the O'Neil building has been carved up into wildly expensive condominiums. It still has its iron facade and cuppolas, and there's something to be said for that. New York's filled with gems like the O'Neil building and I'm fortunate to have a friend like Tom who takes such pleasure in pointing them out. I doubt I'm going to start buying $5,000 suits any time soon, but I can see the fashion world's influence through the worlds of art and commerce in a way now that I couldn't see before. So let's say Jason Wu picks bright yellow to use as an accent on a dress and he settled on that yellow because it reminded him of something he saw or read. Anna Wintour approves of the dress with the yellow accent and puts it in Vogue. The editors of Elle Decor and Metropolitan Home see the yellow accent and start homing in on yellow accents in the rooms they profile. Manufacturers see a yellow throw pillow highlighted in a shelter magazine and start integrating yellow and other bright colors into their lines the following year. I get a furniture catalog and start seeing all of these bright colors coming out and when somebody asks me what's the hot new color, I say "Yellow, it's all over the new furniture catalogs." And all of that started with someone like Jason Wu taking a walk on a Sunday afternoon and seeing a yellow butterfly or raincoat or traffic light. A week ago, I thought my answer to that question stopped with what the manufacturers were showing me. Now I can see the line it follows to get to me more clearly. The more I think about this the more I can see that what happens on the runways of New York and Paris directly effects me, what I do for a living and also what I like. It's interesting and I really haven't thought about it before. And just think, I never would have seen any of that were it not for a forward-thinking faucet company that watches these runway shows like hawks for the very reason I just described. Thanks again Brizo! How green am I about your time in the Hanansen studio???? Chartreuse? Avacado? Perhaps I should consult with Ana. I will never forget the scene in The Devil Wears Prada when the Ana Wintour character explains why fashion IS important. Basically, it was your point above about the yellow accent. By the way, I'm still waiting for my post card . . . .